This draft report was released on 6 February 2019. You were invited to examine the draft report and to make written submissions by 25 March 2019. The final report is expected to be handed to the Australian Government in June 2019. Appendix B is available to download online only and is not in the hardcopy. Existing airport regulation benefits the community, and remains fit for purpose. The four airports monitored by the Australian Competition and Consumer Commission — Sydney, Melbourne, Brisbane and Perth — have not systematically exercised their market power to the detriment of the community. Each has generated returns sufficient to promote investment while not earning excessive profits. Most indicators of the monitored airports’ operational and financial performance are within reasonable bounds, although some could present cause for concern if considered in isolation. There is no reason for airport operators to become complacent — further scrutiny of some aspects of airports’ performance is warranted, and tailored reforms are needed to address specific areas of concern. Sydney, Melbourne, Brisbane and Perth airports have market power in services provided to airlines. Charges to airlines for international services at Sydney and Brisbane airports, in particular, are high compared to overseas airports. Sydney, Melbourne, Brisbane and Perth airports should be required to separately report revenues and costs of providing domestic and international services to airlines. Separate reporting is needed to determine whether charges are the result of an airport exercising its market power, or the higher costs of providing international services. Airports could exercise their market power in landside access services, such as for those used by taxis and shuttle buses, to encourage people to use airport-owned car parks, but there is insufficient data to determine whether this is the case. The collection of detailed data on access charges, terms of access, costs and revenues for landside services would enable an assessment of exercise of market power in landside access. On balance, commercial negotiations between airports and airlines give little cause for concern. However, some agreements contain clauses that constrain an airline’s access to regulatory remedies for the exercise of market power and clauses that restrict an airport’s ability to offer incentives to airlines other than the signatory airline. These clauses are anticompetitive and should be removed from all agreements. Many consumers resent the cost of car parking at the monitored airports. Car parking charges are not due to airports exercising their market power — the price of parking at-terminal can largely be explained by the value passengers place on convenience, the limited amount of land close to the terminal, and the need to manage congestion. Sydney Airport’s regional access arrangements facilitate access for airlines flying to regional destinations, but the regime should be changed to allow airlines to use non-regional aircraft movement slots for regional or non-regional flights. Sydney Airport’s cap on aircraft movements restricts the effect of aircraft noise on local residents, although this reduces the airport’s efficiency. The Commission is seeking further evidence on options that could meet current noise objectives at lower cost. Prima facie, the characteristics of markets to supply jet fuel have enabled incumbent fuel suppliers to restrict competition, which has led to a small number of fuel suppliers at some airports. This has likely led to higher prices to access infrastructure services and higher fuel prices. Government funding for infrastructure investments at regional airports should be subject to rigorous published assessment. There is also considerable scope to improve the financial management of airport assets at some regional airports. Australian airports are investing to meet soaring demand for travel, and operate efficiently by world standards, but Sydney, Melbourne, Brisbane and Perth airports should be required to provide more information to the Australian Competition and Consumer Commission on their operational and financial performance. 'The current form of economic regulation remains fit for purpose although more scrutiny of Australia’s four busiest airports is justified to ensure prices paid by airlines and passengers do not lead to monopoly profits', said Paul Lindwall, who today released the Productivity Commission’s draft inquiry report into the economic regulation of airports. 'The Commission has concerns about some aspects of the performance of the four monitored airports and would not hesitate to recommend more heavy handed regulation if they use their market power to charge excessive prices in the future', Mr Lindwall said. Reforms to enable greater scrutiny of airport charges paid by transport operators, like independent operators of car parks near the airport and ride-sharing services, are needed because these services compete with airport car parks. 'Airports are able to boost demand for their car parks if charges for commercial vehicles to access the terminal precinct are too high', said Mr Lindwall. 'We've also questioned whether some clauses in contracts between airports and airlines are anticompetitive. For the final report we will be examining very closely the charges paid by international airlines to use airport services, like runways and terminals, at Sydney and Brisbane airports', Mr Lindwall added. 'The Commission needs more information to determine if there is a way to increase competition in jet fuel markets to push prices down,' Mr Baxter said. 'Jet fuel accounts for the largest single source of airline operating costs and a one cent per litre reduction in the fuel price could result in a $90 million reduction in those costs per year', he added. The number of passengers travelling through airports in Australia has doubled over the past 20 years to about 160 million in 2017. Sydney, Melbourne, Brisbane and Perth airports account for 114 million, or almost three quarters, of Australia’s passenger movements. The closing date for submissions to the draft report is 25 March 2019. Australia is heavily reliant on air transport. We have the highest number of domestic seats per capita in the world. The number of passengers travelling through Australian airports has doubled over the last twenty years. 160 million total travellers in 2017. 100 plus airports with passenger services. Our report examines the market power of the four busiest airports in Australia. Sydney, Melbourne, Brisbane and Perth. They are monitored under a light-handed regulatory regime. 72 per cent of international and domestic passenger movements in Australia. 2.1 Why do governments intervene? 4.5 Are airports exercising market power through commercial negotiations? 8.5 Is there a case for reform? 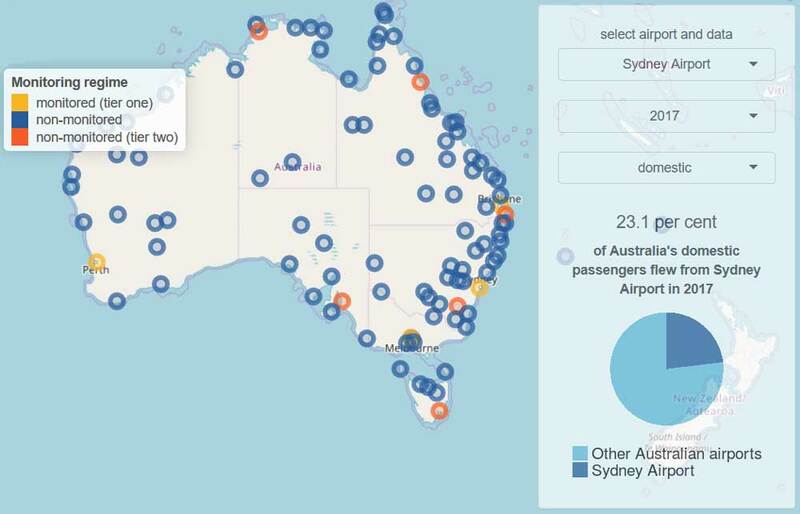 The interactive map shows Australian airports with Regular Public Transport (RPT) services. It is also possible to explore passenger and movement data for domestic and international passengers.